A classic car is nice as is, but there HAVE been some improvements in modern life since 8-Track and Cassette stereo systems! I wanted to enjoy the sounds, connectivity and convenience of a modern stereo and bluetooth system, but didn't want to mess with the look and feel of the car. 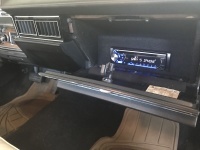 Duane Hildebrand at Mobile Sounds in northeast Calgary came up with a great solution. Hide the stereo headpiece in the glove box! Duane built a fabric-covered box in there for the headpiece. With a hand-held remote, it's easy to manipulate the device from the driver's seat. Oddly enough, the car came with only one speaker on the rear deck, one in the centre-top of the dashboard, and an AM-only radio. I was able to source a second speaker cover (and spray paint it black to match). 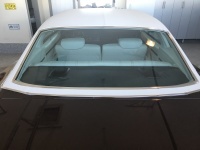 Duane installed two speakers on the back deck and two speakers under the top dashboard surface where there are perforations to allow sound out. What a pleasure to be able to drive now, listen to all the music on my iPhone, any internet or broadcast radio station and receive phone calls hands free in a 1973 car! Doubles the driving pleasure.